BrainFizz - Routing, Making, Custom projects & Training. : Your reputation built on the shoulders of your courier: Reasons to stay clear of Yodel. So a little background, I've been asked to run some woodworking courses with a company in cambridge. I've been thinking about spending a bit on some new workwear as although in pretty good shape the current stuff I'm always wearing in my videos, is at least 5 years old, and I thought it a good opportunity to tie the two events together and splash out on a nice new set and do the first course in some new clean gear, to really show off that professional approach. So I got in touch with my supplier, over a month ago and placed the order. Even though it had to go away to the embroiders to be branded etc, and there was a couple of days lead time ordering a couple of the items, there was still a week free to get the order packaged and dispatched in time for 5th December. On Tuesday I had a call from my supplier saying the order had been dispatched on a 24Hr service via Yodel. So I set aside time to be free and available to take the delivery - I didn't want to be out, and made sure there was somebody standing Vigil or 'Staging on' ready. ?This meant staying out of the shop, and getting paperwork, designs and other bits done rather than be out and about..
Today - December 4th. After 2 days of "online tracking", "corporate excuses" posted to the couriers website and still no parcel I rang Roxie, at snickersDirect, she confirmed that the parcel had been dispatched on the 2nd, was with the courier, and that I should have received delivery December 3rd. I decided that it was time to contact the courier direct and find out where the heck my stuff (that was ordered, packed and shipped in plenty of time for the required date of the 5th December), was currently hiding. With any luck it was in the back of the couriers van and would be on it's way as it was 530P.M. and they say delivery upto 9PM. .....at least up to the point when they tell me it's not coming today. They don't know when it will come, and that it will take 24 hrs to get a message across to get the parcel moving. Oh yeah, then they tell me that my parcel is in the Preston depot! Now My workwear supplier are based in Bolton, and the Yodel Depot is in Preston. 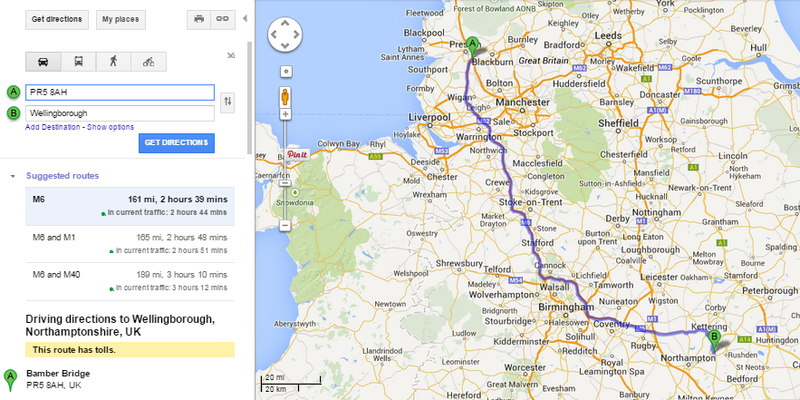 According to google maps that's just over 18 miles North-West (ish) of it's starting point.... The final destination was to be near Wellingborough, Northamptonshire. Just for the sakes of Pedanticness, the distance of Preston to wellingborough is a little over 160 miles, and estimates taking less than 3 hours. Now I'm not suggesting that the parcel could have been delivered in less than 4 hours from the point of posting, but I do struggle to accept the fact that it should take 3 days to make it only to the depot and simply sit there! I will certainly not be putting my trust in a delivery company that provides a so-called 24 Hr service, and only manages to have it sit in their depot. Particularly when they are a near 24 hour operation, with staff working almost around the clock moving logistics. These dates don't even span a weekend or bank holiday, it is simply Tuesday to Thursday - about as mid week as you can get. So what's the reason? well I asked just that! I called the number and spoke to a human being, and was told " I don't know". I even asked when would it be here? and got told "I don't know, I can get in contact with the depot, but it takes 24 hours to get messages chased". SERIOUSLY?! it's a 24Hr service that's been asked (and paid) for, so how can it take 24 hours to simply find out when it's going to get delivered? In conclusion, if you are a crafter, business, ebay seller or anyone shipping out items bought online and sending them to people who want, need or have paid for an item don't put yourself in the undesirable or embarrassing position where future business or your image depends on a quality service provided by your courier, steer well clear, as it will reflect badly on you. My advice, bite the bullet and be prepared to pay a little extra for a courier who can not only deliver their promises, but your parcels too! SO when my new work wear will arrive I really don't know. Hopefully the fact that I'll be running the first course in old, paint stained trousers does not detrack from the professional image I was hoping for, and cost me in terms of other opportunities. I'll let you know How things turn out, what excuses Yodel come up with, and when/if the items turn up at all in (hopefully) the near future!